The Rapid Test Reader “Screen Reader” is a unique Tool for reading and permitting the objective printing of result the several types of rapid tests. Printing Tool realized in accordance with the Law on Occupational Health, notified at the Ministry of Health Italian. The system is able to read the anti drug tests providing alphanumeric reading results, the tool allows doing the Objective Printing of the Drug Test Result. Our Software can be installed on one computer. It works with Windows XP, Windows Vista, Windows 7, Windows 8 and Windows 10. A unique tool that reads and interprets the results of urine or saliva drug tests, tetanus test, streptococcus test, tuberculosis test, Fob test, single-use ETG urine alcohol test, Tuberculosis test, Mycoplasma Test, hCG Pregnancy Test, etc. The system is able to read the test providing alphanumeric reading results, the tool allows doing the Objective Printing of the rapid test result. The operators can also save the screenshot as a PDF file for their own archive with date, test, patient’s name, analysed parameters, cut-off, temperature, etc.. so that they can be printed even at a later time, as a document to attach. SCREEN READER has been designed so as to give the possibility of a paper-based support with alphanumeric characters automatically emitted by the tool. 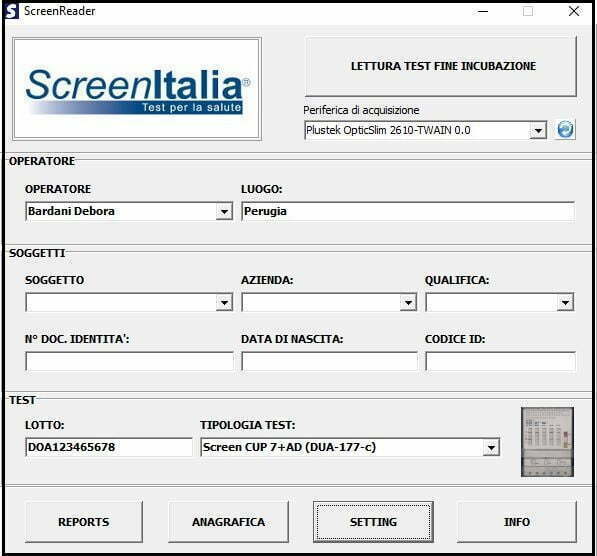 This tool works with the anti drug test SCREEN CUP 8 +AD, SCREEN 7 + AD, SCREEN 8 + AD, SCREEN TETAN TEST, and more of our tests, it is updatable through Internet so as to adapt it to possible changes in the law regarding the verification of the drug addiction absence. The use of the Screen Multi Dip-Line + AD test also allows the automatic reading and the objective printing of the Creatinine and PH result, the use of the Screen Cup + A + AD test allows the reading of the 8 substances requested by law, creatinine, Ph and alcohol in the urine.